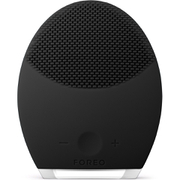 The FOREO LUNA™ for MEN effectively removes impurities from your skin, whilst protecting its moisture barrier to leave it in the optimum condition for shaving. 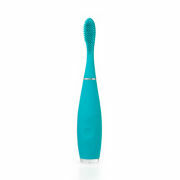 Using 8,000 T-Sonic™ pulsations that are channeled through broad silicone touch-points, it provides a gentle, deep cleansing action to invigorate your skin and eliminate impurities. Just one minute of use will ensure a smoother, closer and more comfortable shave with minimized irritation and razor burn, whilst the reverse surface delivers lower-frequency pulsations that help to reduce the appearance of fine lines and wrinkles for a more youthful appearance. Easy to clean and ultra-hygienic, and because it’s fully waterproof for use in the shower or sink, the LUNA™ for MEN fits effortlessly into any morning routine. Dampen your face and apply your regular cleansing product. Turn on your LUNA™ for MEN by pressing the center button once, activating the Cleansing Mode. After each 15-second interval the LUNA™ for MEN’s T-Sonic™ pulsations will pause momentarily, indicating it is time to move to a different area of the face. We suggest reducing the LUNA™ for MEN’s pulsation intensity with the – button before delicately cleansing the under-eye region using outward strokes. After 1 minute, the pulsations will pause 3 times in quick succession. Press the center button once more to put the LUNA™ for MEN on Standby, then rinse your face and apply your regular skincare products. Close your eyes, relax your face and press the reverse side of the LUNA™ for MEN’s anti-ageing surface to wrinkle-prone areas, where muscle tension can cause worry lines, crow’s feet and laugh lines. Close your eyes, relax your face and press the LUNA™ for MEN’s anti-ageing surface to the region between the eyebrows, the right and left temples, and the right and left nasolabial folds, where muscle tension can cause worry lines, crow’s feet and laugh lines. Try spending around 12 seconds on each wrinkle-prone area; after this interval the LUNA™ for MEN’s pulsations will pause momentarily. After 1 minute, you will feel the pulsations pause 3 times in quick succession, signaling the end of the 2-minute routine. Press the center button once more to turn the LUNA™ off. The LUNA™ for MEN’s broad, rounded silicone touch-points channel powerful T-Sonic™ pulsations through men’s thicker skin more directly to effectively remove oil from their more active sebaceous glands. WHAT IS T-SONIC™ TECHNOLOGY? T-Sonic™ technology refers to the up to 8,000 transdermal sonic pulsations per minute that are channeled through soft silicone touch-points to remove dead skin cells, and unclog pores of dirt and oil. CLEANSING T-Sonic™ technology delivers far more effective deep cleansing than just using the hands alone. This is because the fingers, in addition to often having oil, dirt, bacteria and other contaminants on them, cannot cleanse the pores as deeply as the LUNA™ for MEN or remove dead skin cells, as the LUNA™ for MEN has the ideal texture required to remove impurities from the skin.